An Ultralight aircraft is one in which the gross take off weight is less than 1254 pounds/ 570 kg. This weight includes the weight of the aircraft, the fuel, oil and the (maximum) two people on board. Additionally, the stall speed of the aircraft in the landing configuration must be 45 mph or less at maximum weight. 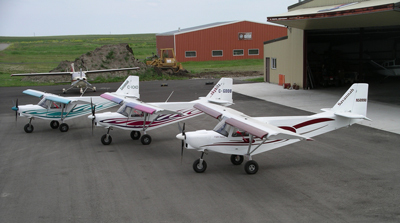 In short, an Ultralight aircraft is much the same as the aircraft of yesteryear, and in fact many of the classic aircraft such as Piper Cubs, Aeronca Champs and Taylorcraft would have fit within the ultralight category of today. However the performance and efficiency of today’s Ultralights have left those aircraft back in ‘yesteryear’. Today’s Ultralights are built with modern aircraft engines, innovative designs and materials that take advantage of all that man has learned about aviation since the historic flight of the Wright Brothers in Kittyhawk back in 1904. 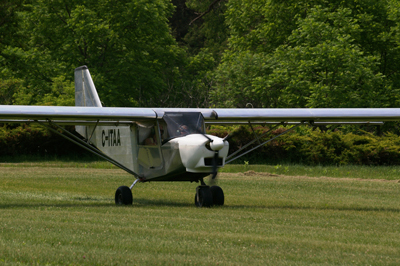 Toronto Aerosport specializes in Ultralight Aircraft, but don’t underestimate these rugged and agile planes. Safe, modern and fun to fly, Ultralight's are fast becoming the aircraft of choice for many recreational pilots and are definitely the future of Sport Aviation. Whether it’s ‘seat of the pants’ open air flying OR the modern sophistication of a metal airframe and plenty of instrumentation that interests you, the number and styles of Ultralight aircraft now available will satisfy any airborne craving that you might have. And if it’s the ‘off road’ style of flying that tickles your flights of fantasy, leave the runway behind and enjoy the freedom of summer float flying or ski flying in the winter for true go- anywhere adventures .